There are currently ten sizes in production, all available in either a sun-grown natural wrapper or maduro. The maduro version seems to be the most popular, but I have to say I like the natural just as well, if not better. The cigars I smoked for the review were from 2006. The tobaccos in this blend are aged for four years to start with, so a few more years shouldn’t make that much of a difference. This is a deliciously smooth smoke straight from the factory, but three years in the humidor might have mellowed it even more. The Exclusivo is the robusto size in the 1964 Anniversary line — a simple 5 1/2 x 50 parejo with an obvious square press. The wrapper is a little dry but consistent in color. As is typical with Padron cigars, it’s a little hard to tell the difference between the sun-grown natural and the maduro wrapper. (In the top photo the maduro is on the left, the natural on the right.) 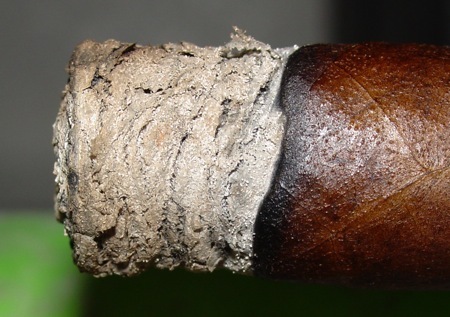 They’re both pretty dark, and a little rough — some of these have really prominent veins, discreetly situated so they run laterally down the cigar. But that’s sun-grown leaf for you. What you lose in aesthetics you gain in flavor. The cap is sub-par for a super-premium cigar, but at least it’s more attractive than what you’ll find on the Padron standard series. Aesthetically the cigar suffers a little, but the rest of the construction is almost perfect — a firm roll, an easy draw, and an even burn — which is worth noting because this is a square pressed smoke. Even the ash is firm and hassle-free. This is a smooth, medium-bodied, very flavorful cigar. It starts up with cedar and coffee with cream. After an inch it becomes more complex, adding some sweetness and a silky aftertaste. The aroma is mild but nicely spiced, reminding me in a way of incense. At one point it occurred to me that smoking this cigar is almost like being in church. The mid-section is a little heavier and exhibits that typically Nicaraguan acidic flavor on the sides of the tongue and back of the mouth. Cocoa notes are up front with some mild spice that keeps pace with a sweet woodsy aroma. The smoke texture is medium-bodied and stays very smooth. The Exclusivo finishes up with a classically maduro finale — coffee and chocolate with a beautifully creamy texture. This cigar lacks the third stage bitterness that makes an appearance towards the band of most ordinary cigars — only at the very end is there some bittersweetness and a little char. The Padron ’64 doesn’t get reviewed too often, probably because it’s so well known and because there is a general consensus that it’s a damn fine smoke. It’s a cigar you’d rather enjoy than analyze. It’s not as bold as many other Nicaraguan puros, but it’s perfectly balanced: smooth and creamy, yet nicely spiced. It burns without a second thought. And it’s simply one of my favorite cigars. If you’ve never smoked the Padron ’64 before, you really need to treat yourself sometime. Average retail is around 11 USD for the Exclusivo. Last summer we reviewed, with help from our friends, the entire range of the standard Padron series. This was a great exercise in “vertical” comparison, and we had a heap o’ fun doing it. I squirrelled away a few cigars from that test and last night seemed like a good time to see how they’re coming along. The Padron 2000 fit my time slot just right: about 45 minutes around sundown. Some cigar makers are able to combine flavor, quality workmanship, and aesthetic appeal all in one sweet cylinder of tobacco. Padron is not one of those cigar makers. The flavor and construction of these Nicaraguan puros is not to be denied, but Padron’s reputation is based on consistency and taste, not good looks. This is honestly one of the ugliest cigars I’ve seen in a long time. The wrapper leaf is a rich dark brown color — a little lighter than most maduro cigars — and it has a rough texture. Glue spillage gives it a crusty appearance in places. The cap looks like it was glued on by a three year old, and this particular cigar features a poorly applied patch a little smaller than my thumbnail. The roll is firm, but dented in a couple places. It sort of looks like this cigar was made by a committee of crafty Nicaraguan school children. Or more likely, by a torcedor on Friday afternoon with one eye on the clock. But the draw is good and the burn is fine. And what would you prefer — a gorgeous cigar with deal-breaking construction flaws, or an ugly duckling that performs? Me? I’ll take the duckie. The aging of this cigar shows in the flavor, which right out of the gate is classic Padron — woody with a touch of black pepper — but it has toned down a little from a year ago. There’s a hint of that sweet pecan flavor I find occasionally in some Padron maduros, and later on some leather and burnt coffee bean. The finish grows substantially at the midway point, and close to the band the aftertaste takes on a strong taste of char. But all of these flavors seem to be less profound than they were when this cigar was relatively fresh — on the other hand, the smoke is also less aggressive. Compared to the freshies, the aged Padron 2000 maduro is much smoother. I still wouldn’t qualify it as smooth per se, but by comparison it is a much less boisterous smoke. At around 3 USD and change this little maduro is still hard to beat as an everyday smoke, but I think I prefer the boldness of the fresh ones over the slightly more refined character of the more mature stick. A few weeks ago when we first started the Padron Roundup we came across the term “grain,” as applied to the unusually large raised dots on many Padron cigar wrappers. In the first Roundup Post (the Padron 7000) we cited a Stogie Fresh article that seems to explain the phenomenon quite adequately. 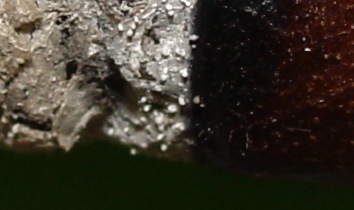 Initially we thought that should be easy, because “grain” as we knew it was the more prominent epidermal structure we were seeing a lot on Padron wrappers, especially the maduros: the raised dots that are visible as white dots in the ash. Tooth, on the other hand, describes the rough surface of some wrapper leaves, Cameroon in particular. If they are distinct in the ash, then they must be distinct on the wrapper, right? My first thought was, “Yes. Of course!” But then I took a closer look. First by examining the contents of my humidor, where I was not able to differentiate between what might be tooth and what might be grain, and then by digging through the literature on the subject, which is admittedly scanty. In describing the effects of the fermentation process another article says there is “a change to a uniform and darker color and a grainy leaf texture.”² Clearly a general use of the term. Charles S. Ridgway writes that grain is composed of crystalline bodies. “On burning, these grain bodies swell and cause the pearl-like pimples so frequently seen on the ashes of cigars.” Ah ha! Ridgway developed a way to separate the grain from the rest of the leaf components (a very tedious mechanical process requiring a binocular microscope) so he could analyze the chemical composition of the grain. He found that it was chiefly composed of calcium, with a little magnesium and potassium, in combination with citric and malic acids. Since grain is formed during the curing and fermenting process, Ridgway proposes that the formation of macroscopic grain is caused by the breakdown of cell walls and the “disorganization of the protoplasm,” allowing the formation of minute crystals. Some of these crystals grow by a process of accretion and eventually form solid grain bodies of visible size. Based on this I would think that of the several different types of “grain,” one in particular creates the effect that we saw in some of the Padron maduros. It makes sense that the chemical reaction responsible for producing the bright white specks in the wrapper ash is due to an unusually high level of an element like magnesium in the crystal “grain” when it burns. In the picture below the same type of stippling is visible in the Cameroon ash, but it’s much smaller. The small toothy bumps have merely been reduced to ash, but retain their basic definition. Those little white specks that we’ve been calling grain can only be identified after the wrapper has been reduced to ash. If they are at all visible beforehand, there is no way of differentiating them from any other kind of surface texture. The only way to tell if it’s grain is to light that sucker up and see! Fourteen other vitola sizes are available in the traditional Padron Series along with one which was recently discontinued. All sizes come in lacquered cedar boxes of 26, packaged with cellophane sleeves on individual cigars. Many vendors list a box size of 25. I am not entirely sure why that is. It may be that Padron changed the box count since the initial release. The Corticos are the exception packaged in boxes of 30 or tins of 6. From the Padron website ….. If you are interested in more KOTF info on the Padron Story, you can read it here. The first vitola roped in for the Padron Roundup was the mammoth 7000 toro, so it seems fitting that the last is the slightly smaller 4000 toro. In terms of cylinder volume, the 7000 is the largest in the line, followed by the Magnum (which is almost equal to the 7000) and then the 4000. The Padron 4000 Natural has a dark, relatively consistent milk chocolate brown wrapper that is barely distinguishable from the Maduro 4000. There are a few small veins, but by comparison with other natural wrappers in the line, this one is more refined. The roll is a little lumpy. The single caps are applied well in a flat “Cuban” manner. Some samples showed the ghost of a box press, while others were completely round. A small point, perhaps, but one that I think speaks to Padron’s attention to detail is that the band popped easily off the cigar — a pleasantly common occurrence with Padrons. 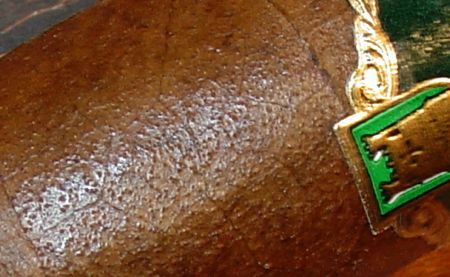 George noted that the prelight scent on the wrapper of this cigar was “a mouth-watering and inviting mint,” while lucky7 reported “very light barnyard” on the wrapper and “slightly sweet tobacco” on the foot. Inspector remarked that it took “a real physical effort” to cut this cigar. Cigarfan experienced this as well when he botched the cut — he had to cut his first cigar twice when the first cut was too shallow. This resulted in the wrapper at the head unraveling a bit after 20 minutes of smoking. He employed a punch on the second stick with much better results. The draw on these varied from perfect (according to three reviewers) to loose on one sample. Our reviewers were greeted by a spicy initial kick with a little harshness on the throat upon lighting up the 4000. Inspector noticed a “tingling sensation on the lips” while cigarfan and lucky7 found the familiar peppery flavors settling after a half-inch or so into earthy tobacco, toasted wood, and the first indications of cocoa. The aroma is woody with a touch of caramel. Inspector related that the first third included “considerable amounts of spice, mixed with tobacco flavors, cork oak, and strong tannins.” The finish at this point is short and dry. When I knocked the ash off I noticed a nice cone burn, which I often take as a sign of the torcedor placing tobacco correctly while rolling the cigar. The burning cone was consistent from beginning to end. Both Inspector and cigarfan noticed that the flavor starts to sharpen up a bit after the first third, but then evens out again. In Inspectors words, “the flavor first becomes very astringent then smoothes out.” After that, he tasted roasted coffee bean and a few sugary notes; lucky7 and cigarfan independently verified the coffee flavors. Into the last third, the flavors get toastier and finally move into leathery territory. Lucky7 found that there was little transition here. In his words, the last third was “uneventful, unchanging,” while Inspector found increasing intensity of leathery flavors. Cigarfan thought the last section was inelegant and strong, but unmuddied. Overall, I would say this was a strong cigar with relatively straightforward taste, primarily that of nice consistent tobacco. Though that was occasionally mixed with some light leather and wood, it was not a complex cigar. There was little change from start to finish, though it did seem to smooth out a bit in the final third. The appearance of the Maduro 4000 is almost identical to the Natural. The wrapper might be a little oilier and slightly rougher, but that’s all. The Maduro seems to be more tightly packed than the Natural, and our reviewers found that the draw was consequently a little tighter, but not problematic. The most remarkable — and consistent — feature of this mildly dark cigar was peanuts. I smelled them when I ran the wrapper beneath my nose, I noticed them on my tongue when I tested the prelight draw and I tasted them throughout the length smoke. Inspector held his cards close and simply said that the prelight aroma was “sweeter and more pronounced” than the Natural. After fifteen vitolas in natural and fifteen more in maduro, cigarfan said he was tired of sniffing cigars and lit up his 4000 Maduro blind. After the initial bite, the 4000 settles into toasted wood and coffee flavors. Lucky7 also reported “notes of fruit (there are those raisins again)” and sweetened cocoa on the short, crisp finish. …the burn displayed a similar cone to the Natural, but it flattened out at about the halfway point and remained that way to the end… Smoke production was full and thick, a great complement to the flavors that shifted throughout. The aroma as it swirled around my head was pleasant as well. I would rate the Maduro a medium-to-full bodied smoke, a tad lighter than its Natural sibling. The final section of the 4000 Maduro is quite strong tasting, bringing bittersweet chocolate, char, and finally pepper to the table. Cigarfan thought it tasted like Connecticut broadleaf more than Nicaraguan Habano, while Inspector said that it was “definitely full-bodied. The spice dissipated to give way to cocoa undertones.” Lucky7 reported “plain tobacco with undertones of dark chocolate” and bitterness at the nub. The first few puffs generated a spicy undertone to the peanuts, with leather taking over about an inch into the cigar. The spice came back stronger and lasted another inch or so when I detected some cedar and leather again There was some bitterness — the unpleasant back-of-the-throat kind rather than the sometimes intriguing flat bitter taste — for a little while about halfway down. But that subsided as the peanuts returned. All in all, the cigar repaid attention with subtlety and intricacy. Once again, our reviewers split down the line in terms of preference: everyone had complimentary things to say about both versions, but George and lucky7 favored the Maduro slightly, while Inspector and cigarfan chose the Natural. Cigarfan agreed with both of those statements, but found that the sheer brawn of the Maduro after the first half overpowered the flavor dividends it disbursed. The Natural, while not as complex as the Maduro, maintained its balance throughout the smoke and dispensed enough flavor to keep the party going for an hour and a half. One of the aspects of cigar smoking that I really enjoy and use as a discriminator is aroma (or nose as I like to call it.) Not the aroma in the room but rather my olfactory senses. These two cigars have got it. That wonderful aroma that I enjoy while smoking and think about when I’m not. Each vitola was easy going after the initial bite subsides and scrumptious for the first two-thirds. For slightly more than $4.00, I say you can’t go wrong. I give a very slight edge to the Maduro in terms of preference but actually, I liked both quite a bit and will be spending time with the 4000 many times in the future. Thanks to Inspector and, once again, to George E. for contributing their considered opinions to the Padron Roundup. Inspector is the founder and chief architect of Cigar Inspector, and George reports the news and writes reviews for The Stogie Guys. And a final note of thanks to all of the fine folks from the blogs and forums who took part in the Padron Roundup. Your participation made this a truly balanced and — we hope — sincere evaluation. Coming up in a few weeks will be our vertical review of the entire Padron Series. We hope you’ll come back and let us know your thoughts. Padron’s 2000 Maduro is arguably the most popular cigar in the Classic Series — it seems to be the most commonly available size on the shelves in the local cigar shops, and one of the most discussed cigars on the forums. Of all the vitolas, natural and maduro, reviewed at Top 25 Cigar, the 2000 maduro has the highest number of reviews, and with a cumulative rating of 8.3 it’s also one of the highest rated cigars in the Series. This is due in part to the popularity of the size. The standard 5 x 50 robusto is a nice size for a couple reasons: first, it’s short enough to smoke in a reasonable amount of time, and second, the large ring gauge allows for a large volume of cool smoke, a comfortable draw, and usually a well regulated burn. In the past year or so we’ve seen a nostalgic swing back to the thin cigar, but the market is still dominated by robustos, toros, torpedoes, and the like. The “Thousands” series are all large ring gauge cigars, but the 2000 is Padron’s standard robusto contribution. The prelight characteristics were unremarkable: compost and hay on the wrapper, and sweet tobacco on the cold draw. The draw on the 2000 natural varied from perfect to slightly loose, and the burn line was straight for the most part. The accumulated ash was strong and medium gray in color with some dark striations and minimal flaking. Most Padron cigars in this series start up with a peppery raspiness, but the 2000 natural was fairly gentle by comparison. Initially the power seems to be in the nose. As lucky7 says, “… with this kind of initial bite you may want to save the sinuses until you are a half inch in.” Matt noted pepper, wood and earth as initial flavors; lucky7 and cigarfan added leather to the list. Beyond this, lucky7 detected subtleties such as “notes of fruit, caramel and spice with hints of vanilla.” The finish at this point is short, dry and woody. One third of the way through the pepper was still there but was muted; I really liked the fact that it remained. The cigar mellowed like the 2000 maduro and offered fewer complexities. Leather and nuts entered the mix, and wood notes were turned up a bit. I noticed some grassiness over what could be herbal/floral flavors. The last third is marked by a body that grows from medium to full at the nub, continued woody flavors with some sweet elements, and a touch of earth. The finish has crossed the line to moderate in length and the aftertaste is slightly bitter with some char. It should be no surprise to hear that the Padron 2000 Maduro is lacking in the aesthetic department. Rugged, dark, veiny, and downright ugly were some of the adjectives employed to describe this popular favorite. The wrapper is oilier than the natural but less grainy than many of the other maduros in the line. Once again, some of the caps were loose and one sample appeared to be underfilled at the foot. The cigar is slightly box pressed (what lucky7 calls “squash pressed,” where the press is evident front to back only oriented by the band) and is firmly rolled. The prelight scent is similar to the natural, but with an added sweetness on the wrapper and a hint of chocolate on the foot of the cigar. The draw is excellent with just the right amount of resistance. About a quarter of the way through, Matt’s cigar started to burn off kilter. I corrected the burn by smoking it hot (a touchup wasn’t necessary.) I was impressed that the cigar didn’t punish my taste buds for smoking it hot; it got a bit stronger, but not bitter. The cigar produced copious amounts of smoke. I wish more cigars could produce such huge volumes. After taking each draw (which was near perfect) I really liked watching the wisps of blue and brown tinted smoke come off the foot, and the thick grey-white smoke continue to pour out the head. Smoking our way into the middle section produced creamy smoke with more bean flavors — creamed coffee and cocoa — over a foundation of sweet wood and leather. The peppery flavors diminish and give way to some nice subtleties: Matt noted complex flavors like anise, nutmeg, and oak. In the last section we noticed the flavors decline a bit into charred wood, leather, and at the end, burnt coffee. The finish lengthens into a peppery conclusion that finally capitulates with a bitter aftertaste. Despite the burn problems and the anticlimactic last third, the maduro 2000 is still a great value. At a box price of $2.50 the first two thirds of the cigar are certainly worth enduring the troublesome burn. With the Padron 2000 we have a case where the distinction between the maduro and natural cigar is much more apparent than we’ve seen in previous sizes. They are visually distinct as well as having discrete organoleptic qualities: the maduro is definitely sweeter, bolder, and richer in flavor than the natural, while the natural is milder with a far more subtle presentation. The natural wrapped version seemed less complex but the flavor was more enjoyable to me. It was notably “cleaner” which has been my preference of late. The pepper flavor remaining longer was also a big plus. The robusto was my favorite size cigar until recently when I began dabbling in some smaller ring gauges. It comes in at about an hour on a regular basis and most often that is the perfect amount of time for me. It also allows the smoker to experience more nuances of the blend, in my opinion. Other than time spent, the 2000 didn’t do that for me. Although both were decent smokes, I found them ordinary and uneventful… Between the two, I found the Maduro tastier but probably won’t go back to either one if I can lay my hands on a 3000 for fifty cents more. These cigars have been longstanding benchmarks for me when trying new cigars; if a cigar costs more than four bucks it has to prove itself better than the X000 series for me to buy them again. Thanks to TXMatt for giving us hand with the Padron 2000. If you’re a Club Stogie member you know that on the subjects of Pepin and Cheap Smokes, he knows whereof he speaks. And if you’re not a Club Stogie member, why not check out the jungle some time? But we don’t really expect the Padron Churchill to conform to Cuban standards, and it doesn’t. It’s a bit shorter and a bit narrower than the Julieta 2; in fact, it’s the same dimension as the Delicias, but two inches longer. But that is where all resemblance to the Delicias ends. This is a different cigar altogether. The natural wrapper on Padron’s Churchill has a reddish cast to it, a colorado maduro shade that distinguishes it not only from the maduro Churchill, but from the other natural vitolas in the Padron Series. The leaf is slightly veiny, moderately grainy, and otherwise about as rough as most of the other naturals we’ve smoked. It wouldn’t be a classic Padron without a few superficial dings and scratches. The head is flattened and as usual the caps tend to be a bit loose. The roll is lightly box pressed but solid, with a few dents here and there. McCharlie noticed that the natural was “slightly less springy” than the maduro, and lucky7 found straggling bits of tobacco bristling from the foot. After reading several other reviews on the churchill I noticed many of the reviewers commented about the fairly loose draw of the churchill, which was not the case with these particular churchills. The draw was not too tight, but tighter than what most others I think have said. McCharlie went on to say that the middle section features “full bodied nut, wood, and good old tobacco flavors.” Cigarfan noted a “solid core of hardwood with a sweet edge and diminishing bean flavors” while the flavors “turned quite bland” for lucky7. The creamy texture of the smoke is also noteworthy at this point. The last third continues along the same path: simple mild tobacco flavors and a hint of char at the end. We were all a bit surprised by the mild mannered nature of this cigar, since it’s not what we’ve come to expect from Padron. Lucky7 called the body and strength of this cigar “mild to medium through the first two thirds, building to medium plus at the nub.” Mild to medium is not what most folks will tell you about Padron cigars. The maduro wrapper on the Padron Churchill is veiny with a very light layer of oil — the color is effectively a dark matte brown with little sheen. The heads tend to be round rather than flat, and a little misshapen. There are a few other minor aesthetic defects like small holes in the leaf and sloppy cap work, but the roll is firm (if a bit lumpy) and the draw resistance is good. The prelight characteristics are typical of mild maduro: grass and compost with a touch of chocolate. McCharlie described it as nutty/woody, and his sister thought it was more “tobaccoey” than the natural. The burn is straight and needs no corrections and the ash is a solid light gray with little flaking. The smoke volume is a little thin to start but increases in body and texture to medium at the midway point. The flavors become more pronounced in the middle section and get toastier: a woody foundation over which a sweet char floats, resembling toffee at times. McCharlie noted diminishing coffee flavors and “more of a nutty spice flavor” in this section. The finale turns up the heat a little, but the flavors turn darker and somewhat more plain: strong tobacco, burnt coffee, and harsh spice were among the descriptions of the flavors at this point. The finish lengthens, but the aftertaste becomes bitter at the two-inch mark. Our overall impressions were that this is a fine cigar, if a bit mild, for the first two-thirds, but it goes downhill from there. But like the natural, it’s still a great value. The Churchill is quite distinct from other cigars in the Padron Series — for one, it is probably the mildest blend in the series. Other cigars in this category might be the Magnum and the Executive, but the churchill was probably the least aggressive of them all. All of our reviewers enjoyed this cigar, even if it wasn’t a highly dramatic experience. Both cigars were very enjoyable. The natural had more of that smooth wood and nut flavor I really enjoy, perfect for smoking in the morning… The maduro was a little bit stronger, something I would smoke after a big steak dinner. But if I had to choose one box to buy right now it would be the naturals. The natural has more of the good all around flavors I look for in a cigar at this point in my cigar smoking journey. It is truly a toss up regarding preference. I liked them both and will consider adding them to my list of smokes to stock for times when I’m reaching for a milder smoke. Even though the last third is, let’s say, uneventful and bland… for around $3.00 you can’t beat the first two thirds. Cigarfan enjoyed both of these cigars as well, but rated the natural just slightly higher for the cocoa bean flavor and smooth creaminess of the smoke. Taken together, the Churchills are high on his list of the best of the classic Padron Series. Many thanks to guest reviewer McCharlie, who almost had to forego his review for the Roundup when he was called into service as a National Guardsman. We would like to single him out for a moment to recognize his service to his country and fellow heartlanders as they struggled to deal with the wrath of mother nature. We all remember the recent flooding in the mid-west where so many were forced from their homes. It was so bad in Illinois, Governor Rod Blagojevich called in the National Guard to assist in shoring up the Sny levee system along 54 miles of the Mississippi River shoreline. If this levee had failed, hundreds of thousands of acres of farmland and several small towns would have been flooded. The levee had not been breached but as McCharlie tells it, the water level on the river side was so high your feet got wet walking along the top of the levee. Along with nearly 1000 Guardsmen from across the state, our own guest reviewer McCharlie, member of the 182nd Airlift Wing, jumped to action and spent the better part of a month building up the levee and fixing potential leaks. The townsfolk were so grateful for the help, they pretty much kept the Guardsmen fed with good ol’ down home cookin’ saving them from the dreaded MRE (Meals Ready to Eat). Although MREs are much better than they used to be, you certainly wouldn’t eat them given a choice. With the breadth of flooding and the continued onslaught of bad weather in the region, we thought McCharlie might be lost to the Roundup. Cigars just don’t smoke well in the rain and, even if you can sneak one, taking notes is nearly impossible. We were glad to hear the work along the river was completed in time and are very happy to report McCharlie’s valued opinion is represented in this review. Our thanks to McCharlie and all of the National Guard men and women who sacrifice so much and put in some really hard work whenever they are called. True patriots here on the home front! The lancero has been a standard in the Cuban cigar pantheon, exemplified by the Cohiba Esplendido, but the Padron Panetela is thinner yet – nearly as narrow as the Corticos, but of course longer. The wrapper to filler ratio in a smaller ring gauge cigar highlights the wrapper’s aromatic qualities, so it’s no wonder that it has made the comeback that it has among experienced cigar enthusiasts. On the other hand, the thin cigar is prone to construction flaws: a tight draw and hot burn chief among them. The pre-light characteristics were unremarkable aside from a draw that was clearly inconsistent from cigar to cigar. Some were quite tight, others fairly loose. Barnyard scents and a hint of leather dominate the pre-light aromas. The initial flavor notes on this cigar weren’t very strong. There were definite leather hints and some spice, but not much else. As the cigar progressed in the first few minutes, the flavors got stronger, but leather was definitely the predominant note, with hints of spice in the background. I gave it a few long, languid puffs and cleared my palate a couple times, but the leather and spice was all that I could note in the flavor profile, much to my annoyance. Initial flavors are leathery with hints of hardwood and raisin in the background. Between the leather and a dry texture, it is reminiscent of some lighter DPG blends but with a shorter, less satisfying finish. Lucky7 and cigarfan found the first stage of the cigar smooth but uneventful: toasted wood flavors serve as a foundation, over which there are sweet tobacco flavors and a slightly fruity aroma. The texture is creamy and quite pleasant. Cigarfan detected some cocoa as well, while lucky7 noted a little bitterness and a short finish. Otherwise there didn’t appear to be much development. …the spice notes came back with a vengeance and pushed the leather into the background about halfway through the cigar. The spice here was mostly peppery, with some slight char notes. At this point I finally started to enjoy my smoke and settled back into my seat. The maduro wrappers were typical of Padron maduro: just a couple shades darker than the natural, with a little more oil, a fine layer of grain, and a pre-light scent of compost, chocolate and coffee. A couple of the maduro Panetelas had what appeared to be loose wrappers, where the wrapper seemed to warp and separate from the roll. They looked like they might unravel immediately on cutting, but they actually stood up pretty well once cut and lit. The draw on these tended to be a little firmer than the natural, but they also seemed to burn a little better. “…a sharp, vegetal funk from the outset. I hit this one very slowly for the first two inches, just enough to keep it lit, as I was concerned this bite might contaminate the entire smoke. Lucky7 remarked that after the initial blast wears off it mellows to a “core of chocolate and coffee, with notes of toasted wood and spice, along with a sweet aroma and a familiar twang on the nose.” Cigarfan found some sweet notes here, but felt that these were overwhelmed by pepper and a hot burn. By the time the smoke got to the middle section, the leather had pretty much disappeared. The strong spice kept strong, while the coffee and molasses notes played in and out. Also in the middle section came some delightful tastes of hickory and dark chocolate…that created a nice complexity. It became more smokeable after a third, but it retained a thin, sharp bite. At halftime, it still tastes green to me. Compared to the natural, the maduro was certainly stronger and more peppery, but not pleasantly so. Many cigar smokers are partial to Padron cigars in maduro, which has given Team Maduro something of a home field advantage throughout the Padron Roundup. The extra fermentation gives the maduro an added dimension that is lacking in the natural, but at the same time can create an unbalanced smoke if the blend isn’t just perfect. I preferred it to the natural wrapper completely. This isn’t usually a vitola that I would smoke, but for this cigar, I can see myself making an exception. This was a great cigar. I expected to like the maduro better than the natural, but that’s not how it panned out. Where the natural was easygoing and seemingly well aged, the maduro was aggressively young. The burn and draw were above average, but I hold out little hope for the flavor. Where the Corticos had good flavor to the nub, the Panetela was rather bland in the last third. Considering the cost, the little Corticos is just as big a bang for the buck and it takes up less humi space. Thanks again to Alex and Kevin for participating in this bout of the Padron Roundup. Both provided some excellent photos in addition to their reviews. Alex regularly contributes reviews and commentary to the Cigar Jack website, and Kevin is the wizard behind the curtain at The Box Press. Be sure to check ’em out!